Leroy Loggins was born December 20, 1957 in New Brunswick. His family moved to Baltimore when he was a boy and he learned the game of basketball in the city parks and gymnasiums. Tall and thin with great jumping ability, he hoped to become a star at Forest Park High School on Chatham Road—a school famous for producing Spiro Agnew, Barry Levinson and Mama Cass—but quit the varsity after a handful of games because he wasn’t seeing enough playing time. After graduation, Leroy enrolled at Baltimore City Community College. There he put his hoops skills on display and earned a scholarship to Fairmont State College, an NAIA school in West Virginia. He made the NAIA All-Star team as a junior and toured Australia that summer. There was talk of a pro league forming there and he thought it might be fun to come back and play some day. In two seasons with the Falcons, Leroy distinguished himself as a flashy shooting guard who could also handle the small forward position. At 6’5”, he drew enough interest from the pros to be picked in the 8th round of the 1980 by the Detroit Pistons. Unfortunately, he did not make the team. Half a world away, in Australia, the National Basketball League had become a reality and was looking for talent. Leroy signed to play with the Brisbane Bullets and helped them reach the post-season semifinals in 1981. He spent the next two seasons with the Adelaide Bearcats, teaming with Al Green, a point guard who’d grown up playing with Bernard King in the Bronx. Green was the NBL’s MVP in 1982. Leroy scored 32 in the NBL championship game that year and was named man of the match. Earlier in the year, he was MVP of the NBL All-Star Game. Leroy returned to the Bullets in 1984 and immediately distinguished himself as the league’s top star. He was the MVP of the NBL in 1984, 1986 and 1987, and led Brisbane to NBL titles in 1985 and 1987. 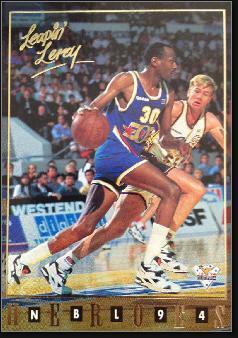 Aussie hoops fans fell in love with “Leapin’ Leroy” and he adored Australia. He would become a naturalized citizen in the early 1990s. He went on to represent Australia in the 1992 Barcelona Olympics along with Andrew Gaze and Luc Longley. By that time Leroy had been named captain of the Bullets, a position he maintained for the rest of his career. He retired following the 2001–02 season at the age of 43. In 21 NBL seasons, Leroy averaged 23.1 points per game and was second all-time in steals. He still holds the record for 40-point games, with 23. He was named Defensive Player of the Year twice and was First-Team All-NBL nine times. In 2006, Leroy was enshrined in the Australian Basketball Hall of Fame. He married a native Australian and now speaks with an Aussie accent. In 2016, Leroy was named as an honorary club ambassador for the Brisbane Bullets. Each year, the team’s MVP is awarded the Leroy Loggins medal.